A small group of scientists and engineers assembled at the East-West Environment and Policy Institute during the summer of 1980 to examine the question “How can environmental concerns be brought into the biomass energy development process?” The state of Hawaii, which has numerous biomass energy developments underway or under consideration, was used as a case study to make the group’s thinking more specific and relevant to real-world problems. Energy tree farms and fuel ethanol were given particular attention because of their prominence in current discussions about biomass energy in Hawaii. The group’s primary conclusion concerned the need for more effective means of communicating the impact that environmental effects from specific kinds of biomass energy development will have on the quality of human life. It is helpful to cast environmental concerns in terms of broader issues, so energy policymakers, planners, and investors can judge them alongside the numerous other concerns they must weigh in their decisions. Five research areas were identified as deserving further development: (1) a clearinghouse for technical and environmental information on processing options for alcohol stillage waste; (2) an atlas on the amount of land suitable and available for biomass energy farms or plantations in different areas; (3) workshops to give decision makers in energy development a better understanding of environmental issues and how they bear upon their responsibilities; (4) analyses of the economic and environmental benefits and costs to be expected from biomass energy development; (5) means of streamlining environmental regulations for energy development. Many countries throughout the world are seriously seeking ways and means to reduce their petroleum imports, especially as a consequence of spiraling petroleum prices of recent years.1 Many studies have shown that measures to reduce energy consumption could be the most effective way to deal with this problem. Yet energy conservation is not the only recourse available. Many nations are also directing an effort to develop alternative sources of energy to replace petroleum. Some new sources can be developed quickly; others will not make a significant contribution to the energy picture for many years. Furthermore, since existing technologies for biomass energy production are available for immediate application, this source of energy is under serious consideration for large-scale development in the near term in a number of countries.3 It is a matter of producing agricultural or tree crops in a fashion similar to the way food and fiber crops are already produced, with modifications to make the farms more efficient specifically for energy production. The use of fuelwood for industrial process heat and for household heating and cooking are well established practices. Other methods of conversion that are coming into use and may someday be practiced on a large scale include burning plant material in a boiler to generate electricity or converting it to a liquid fuel such as alcohol, which can be substituted for gasoline. Although there are many technologies for conversion to liquid fuels that are not yet operational on a commercial scale, at least one--the production of ethyl alcohol by fermentation--was well established long before the energy crisis occurred. Large-scale production of biomass energy can entail equally large-scale and critical social, economic, and environmental implications. Once any surplus of biomass in existing forests is used up, large quantities of plant material can be produced only by committing large areas of land to agricultural crops or tree plantations. Conversion of the material to liquid fuel produces large quantities of liquid waste, and the combustion of biomass, as with all fuels, generates air pollutants. In the case of solid biomass fuels, there remains an ash to be disposed. Boilers to generate large amounts of electricity, factories to produce ethanol or other liquid fuels, and land facilities for the storage and transport of fuels all require expensive equipment. The development of biomass energy on a scale large enough to replace significant quantities of petroleum-based energy requires large capital investments and a commitment to a complicated support infrastructure. It is therefore important to assess environmental consequences before large-scale commitments are made. The East-West Center provides a forum for scientific interchange between the United States and countries of the Asia-Pacific region, and the Center’s Environment and Policy Institute is involved with the environmental dimensions of policy questions of regional and international interest. This report concerns the environmental dimensions of policy questions surrounding the development of biomass energy as an example of alternative energy development in general. This report is the result of a study that explored how environmental considerations can be brought into the planning and development of biomass energy. In order to identify research areas that are significant to countries that are developing biomass energy or considering its development, a small group of scientists assembled at the East-West Environment and Policy Institute for several months in the summer of 1980. Their purpose was to exchange information about biomass development in different countries and suggest ways in which environmental considerations might effectively be brought into the process of energy development. The group included scientists and engineers from New Zealand, Australia, Indonesia, the Philippines and the United States. Although most of them held job responsibilities in their respective countries that concerned environmental aspects of energy development, none of them had extensive experience with the environmental aspects of biomass energy in particular. To help compensate for this lack of experience we invited several scientists with experience in the environmental aspects of biomass energy to spend several weeks with the group as consultants. The purpose of this report is to identify specific areas of study that should be undertaken to bring environmental concerns effectively into the process of biomass energy development. The ultimate objective of such studies should be to provide people who are making investment, management, and policy decisions in biomass energy development with a better appreciation of environmental concerns they should take into account and how those concerns might be handled. We decided that we could make our ideas more specific by using the state of Hawaii as a case study. Hawaii is committed to developing alternative energy to reduce its petroleum imports. A number of alternative energy feasibility studies have been conducted for Hawaii in recent years, and a number of biomass energy development projects are moving into small-scale development.4 Hawaii therefore serves as an excellent laboratory for observing the nature of biomass energy development, including how environmental considerations influence decisions regarding energy development. In this report we have used what we learned about Hawaii to suggest areas of research that should be of use to many countries that are developing biomass energy, or contemplating doing so. We have used Hawaii for illustrative purposes only and there is no intention on our part to recommend how Hawaii should develop -its biomass energy. Survey of biomass activities in Hawaii. Discussion of (1) and (2) with consultants. Exploration of ideas to meet those needs. Discussion and study of the applicability of the ideas. The group worked together much of the time during the first two months, visiting the sites of biomass energy development activities in Hawaii and discussing environmental issues with the people concerned. Subsequently, group discussions explored how environmental considerations could most effectively be brought into the process of biomass energy development, and how this could best be presented in a report. In order not to overextend the limited resources of the group, it was decided to focus the study on environmental issues associated with two major biomass development projects presently under discussion in Hawaii: (1) energy tree plantations, and (2) fuel alcohol production. Each member of the group then wrote a working paper on a topic dealing with energy tree plantations or alcohol, developed in as much depth as possible in the one or two months available for the studies. Copies of the working papers, which are referenced in this report and which expand upon the topics discussed here in much more detail, may be obtained upon request from the East-West Environment and Policy Institute. In the past several years, various research laboratories and consulting firms have written several hundred reports on biomass technology, many of them on contract with the United States Department of Energy. Many can be regarded as a first generation of alternative energy studies that are generic in character. The main impression that comes from reading them is that evaluating and planning alternative energy development is a process of overwhelming complexity. Numerous agricultural or tree crops might be used as the plant material, and numerous processes might be used to transform it into usable forms of energy. It is apparent from the reports that it is difficult to predict how well a given approach for producing energy may function on a large scale, including how it would fit into existing systems for energy distribution and marketing, and how it would compete for existing financial resources. It is equally difficult to imagine the numerous possible environmental and social side effects of these massive new energy industries, and even more difficult to communicate what is known about these effects in a way that is useful for others who are responsible for energy policy decisions. The main concern of most reports is the technical and economic feasibility of different production or conversion processes. Although some of the reports do not mention the environment at all, a large percentage provide at least summary assessments of environmental impacts. Such assessments most commonly give information about air or water pollutants associated with the production or conversion processes. Among these reports are a number that specifically address environmental assessment issues.5 They reflect serious concern for the environment on the part of the U.S. government and a conscientious effort by report authors-to cope with overwhelming complexity in the difficult task of environmental prediction. Many of the reports are able to enumerate possible environmental effects only in general terms while treating economic and technical aspects of production with greater precision. Even when environmental effects are explained and discussed in much greater detail, there remain many effects for which it is difficult to assess what they would be like in reality. Some of the reports present tables of source data which can be used to calculate the expected magnitude of the effects for particular situations. However, even with this information, it is often difficult to judge whether a certain effect would be severe enough to warrant concern. This first generation of reports basically enumerates environmental considerations that should be taken into account when developing biomass energy. These reports should be useful to contractors of environmental assessments for particular biomass development projects, indicating which environmental impacts should be covered by an assessment. Most of the reports discuss numerous environmental impacts directly related to the fact that large-scale energy farms would require an expansion of acreage under cultivation, thereby increasing environmental impacts customarily associated with agriculture.6 The major biophysical impacts concern soil erosion, runoff of water, and runoff of agricultural chemicals, the effects of which can impact far from the point of origin, and all of which can be particularly severe if marginal lands are brought into agricultural use. An additional consideration is the need to sustain agricultural systems with fertilizers, due to the depletion of organic matter and mineral nutrients during a harvest. This is a characteristic of intensive agriculture that is accentuated in energy farming if plant residues are removed for energy use rather than left to be reincorporated into the soil. All of these effects apply to tree farming as well as agricultural crops, though they may be less severe due to the longer crop cycles of tree farming. The environmental assessment reports also discuss the competition that would exist between the use of land for energy farms and other land uses. Energy farms could displace other agricultural activities, or they could extend agriculture to new areas, and tree farms could be located in places currently devoted to agriculture, grazing, or forests. Whatever the form of energy farms, the outcome is that they will displace significant amounts of existing agricultural land, grazing land, and/or forests if pursued on a large scale. All of the reports make this basic point, but few take it further. They find it difficult to give specific details of the likely consequences that massive changes in land use would have on the quality of our lives. The reports are generally lacking in a useful translation of the technical information on energy production processes to what this means to human welfare. They provide information, for example, on the concentration of a particular pollutant in the effluent of a particular production process, but they often do not deal with the question of whether that pollutant will accumulate to significant levels in the environment. Nor do they deal with the question of what might be the impact of those pollution levels on human health or other dimensions of human welfare. It is true that evaluations of this sort can sometimes be done only in the context of a specific situation associated with a specific development project. Nonetheless, to be useful for energy planning and policy decisions, evaluations should be stated in terms of human welfare, putting into perspective the trade-offs between different energy development options. Thus, although the reports supply a wealth of information, they fall short of what is needed for policy and planning decisions. The reader is left with an enormous number of facts but little sense of perspective or context. Anyone who is trying to decide between different approaches to biomass energy production--or to contrast biomass energy with other forms of alternative energy--would have little basis for incorporating any of this vast and confusing array of environmental information into a decision. As a consequence, one might be inclined to ignore environmental concerns unless forced by official regulations to deal with specific environmental issues. In this report we attempt to suggest some ways that environmental effects can be stated in terms of human welfare, so that energy policymakers, planners, and investors can balance environmental concerns against the many other considerations they must take into account. This is an ambitious task for which we achieved only a modest beginning. Nevertheless, as we shall see, the presentation of environmental effects in terms of the greater context in which they occur can go a long way towards making those effects more meaningful for those who should consider them before making their long-range decisions. Our purpose in describing the energy picture in Hawaii is to provide a specific context in which to consider such environmental issues as costs and benefits, land use, and the disposal of liquid wastes, each of which is discussed in a section of this report. Figure 1 shows the percentages of major types of energy consumed in the state of Hawaii. Most of its energy derives from imported petroleum, the major exceptions being (1) electricity generated by hydropower or by burning bagasse or other agricultural wastes, (2) a small quantity of ethyl alcohol imported from the west coast of the United States for test marketing 10 percent gasohol, and (3) coal imported for industrial use. The state has embarked on an ambitious program of energy self-sufficiency, part of which aims for local production of the majority of Hawaii’s electricity by the end of the century. It is also possible that within a few years Hawaii will be producing nearly all of the alcohol required for its gasohol. A number of studies and reports exist on alternative energy and energy self-sufficiency for Hawaii.7 These studies deal with the physical feasibility of different kinds of biomass energy, the quantities potentially available, and the roles they could play in Hawaii’s future. They deal also with economic feasibility, although these analyses are limited by the fact that no one can predict future energy markets precisely. None of the studies deals with environmental concerns. Figure 1 shows that aviation fuel is a major type of energy consumed in Hawaii. This report will not deal with aviation fuel, however, because it does not represent a genuinely internal energy consumption, and it does not figure in the state’s planning for energy self-sufficiency. Figure 1 - Percentage consumption of different kinds of energy in Hawaii. The City and County of Honolulu is considering the purchase of an incinerator for its municipal wastes, which could generate up to 3 percent of the state’s present electricity production. Since this incinerator would be purchased with public funds, the law requires an environmental assessment, which primarily examines issues of air pollution, noise, and the land to be occupied by the incinerator operation.9 There is a possibility that the incinerator will never be purchased, because residents in the vicinity of the proposed site have mounted a campaign against it. Sugar processing plants in Hawaii burn substantial quantities of petroleum for electricity and process heat because there are seasons when the supply of bagasse is not sufficient to meet their energy requirements, including contract commitments to the public electricity grid. They are therefore interested in a local source of energy to supplement bagasse. One such source could be energy tree plantations, for which there are currently two small-scale projects underway, both involving Eucalyptus plantations 10 as a source of wood to supplement bagasse in the boilers of sugar processing plants. One of the projects is being undertaken by a private company, the Bioenergy Corporation (a subsidiary of C. Brewer and Co.), under contract with the U. S. Department of Energy.11 This project proposes to plant a total of 200 hectares of Eucalyptus on the Hamakua Coast and Kau areas of the island of Hawaii during 1982-1985. The purpose of this project is to study and evaluate economic feasibility. The second project is one of forestry development for the Hawaii Department of Land and Natural Resources, scheduled to plant 200 hectares of Eucalyptus per year through 1985.12 The trees could be harvested for uses other than energy--eg, export for pulp, which has been the use of mature Eucalyptus plantations recently harvested on Hawaii--if such uses are more profitable. Both projects were required to perform an environmental assessment,13 since both are funded by public money. The assessments have shown the tree plantations to be environmentally sound, but project managers have encountered the problem that it is not clear what constitutes a fully acceptable assessment. Although biomass energy on Molokai is a demonstration project of considerable interest, electrical consumption on Molokai is quite small, and its energy development will not make a significant contribution to the electricity production of the state as a whole. A preproject survey has already begun on plant species and soil and air pollutants, in order to evaluate environmental effects of the energy development project. At the moment, Molokai has only small-scale experimental plantings of Leucaena, butit projects a plantation of 400 hectares with a rotation of four years. An economic and environmental assessment has been completed for the Leucaena plantation, which appears to be a sound land use from an environmental viewpoint.17 Some varieties of Leucaena, one of which dominates much of the Hawaiian landscape, can be a nuisance weed species, but the giant variety of Leucaena, the one to be utilized in the Molokai plantation, does not have propagation characteristics that encourage it to spread as a weed. Although the Leucaena plantation could become an excellent habitat for game animals, it is far from a natural habitat and could not be expected to support native birds or other native wildlife. The plantation will require irrigation to establish the trees and this could compete with other consumers of Molokai’s limited water supply. The Hawaii Department of Land and Natural Resources has indicated that as many as 160,000 hectares in the state could eventually be planted in energy trees. The possibility of large-scale energy plantations in Hawaii has been discussed from time to time, though there are no immediate plans to establish energy plantations on such a scale. To give an idea of the amount of land required to generate electricity by biomass, if 160,000 hectares were dedicated to tree plantations for electricity, they could provide 60 to 70 percent of the state s current electricity consumption. This would cause a major transformation in Hawaiian land use, when one considers that the present land area under agricultural cultivation in the state totals only 180,000 hectares. It is unlikely that tree plantations will be utilized for large-scale generation of electricity in Hawaii because there are many other potential sources of electrical energy available.18 These include windmills, geothermal, and ocean thermal energy (OTEC), anyone of which could meet the electricity needs of the state both now and in the future. Wind energy is available on all the islands, and a small-scale “wind farm” is being established. The problem of insufficient electricity generation during periods of low wind could in theory be overcome by means of pumped water storage or other energy storage facilities. Transport of electricity between the islands (in particular, to Oahu, which is the largest consumer) would require development of an interisland cable, itself an unresolved technical question due to great water depths in some channels. The extent to which biomass will be economically and environmentally competitive with other sources of energy remains to be determined. The biomass developments that have been discussed so far are on a small scale and are intended to meet very particular needs. They will not make a large contribution to the electricity needs of the state as a whole but could provide useful experience for future developments in Hawaii or elsewhere. Biomass energy could be used as a backup for windmills, as could geothermal energy located on the island of Hawaii, for which the technology will be available for development within the next decade. Test drillings for geothermal energy have already proven successful, and the quantity of this resource is known to be substantial, though its full extent has not yet been measured. An experimental plant for OTEC energy is already functioning in Hawaii but considerable technology remains to be developed, and it will probably be several decades before OTEC operates on a commercial basis. The capital investment required for OTEC is high and may require that other sources of energy become considerably more expensive than at present in order for full development of OTEC to be justified, unless there are significant improvements in OTEC efficiency. The amount of energy that could be generated by OTEC in Hawaii is enormous, however, and could be the basis for substantial industrialization, as well as the export of energy from the state in the future. There is also a program on marine algae research at the University of Hawaii,19 but marine algae do not figure in the immediate alternative energy plans of the state. The other major kind of energy consumption in Hawaii is of gasoline. Alcohol to substitute for gasoline could theoretically be produced from the large quantity of sugar Hawaii produces, but the high economic value of sugar does not make it available as an alcohol source in the foreseeable future. The use of alcohol as a petroleum substitute is a complete reversal of industrial practices in the United States during the past 25 years. During that period nearly all alcohol was produced as a petrochemical, which means it was produced from petroleum that might otherwise be used for gasoline. The Hawaiian Sugar Planters Association has prepared a report on existing industrial processes for producing ethanol from molasses, based on a survey of practices in a number of countries.21 It has shown that the technology for producing alcohol from molasses is readily available, but the economics of production are marginal. The cost of production depends primarily upon the price of molasses feedstock, which has risen sharply in the past few years and may be expected to continue to rise as the demand for molasses for animal feed and alcohol production increases throughout the world. However, it is also possible that the price of petroleum will increase even more, so that ethanol from molasses becomes economically viable at some time in the future. In the meantime, those companies contemplating alcohol production appear to be counting on federal subsidies and tax incentives, which already have been approved by the U.S. Congress. Pineapples are another possible source for alcohol production. Pineapples do not require such high quality agricultural land as sugar cane, and researchers at the University of Hawaii have asserted that pineapple plantations grown expressly for energy purposes would be more efficient energetically than sugar cane grown for the same purpose.22 A plantation-factory system now in small-scale development would ferment pineapple wastes to alcohol and burn the fibrous residues to run the distillation process. Most of the energy sources that offer so much promise for Hawaii’s electricity production cannot be used to substitute for the state’s liquid fuel consumption, nearly all of which is now in the form of imported gasoline. The only possibility for large-scale local production of liquid fuel in the near term would be alcohol produced from tree and/or hay plantations, primarily on the island of Hawaii.23 The cellulose that makes up the bulk of these crops could not be fermented directly to ethanol but would first have to be hydrolyzed to sugars, a technology already available. These cellulose crops might also be processed to methanol, a technology that is also available but which would require heavy processing investments and vehicle adjustments to produce and transport the new fuel. It would be possible to substitute the state’s entire present gasoline consumption with alcohol by using 160,000 hectares on the island of Hawaii to produce alcohol feedstock. Although methanol may eventually be cost competitive with .gasoline, alcohol from cellulose does not generally appear competitive at present gasoline prices. Production on such a scale would of course entail the same land use changes mentioned earlier for large-scale electricity tree plantations. (With more profound vehicle adjustments, it would be conceivable to use hydrogen produced by electrolysis from geothermal or OTEC energy.) There are no plans at present to replace a large percentage of Hawaii’s gasoline importations with liquid fuel that is locally produced from biomass or any other energy source. We encountered a range of opinions in Hawaii concerning how energy development decisions should be made. They ranged from an “evolutionary perspective,” which thinks in terms of incremental growth, to a “planning perspective,” which emphasizes long-term solutions. The evolutionary perspective tends to be associated with the private sector, where incremental investments are made if and when they appear profitable. If they work out, further investments of the same sort follow, and this continues as long as there is a profitable market to encourage additional investment. The time frame of this perspective is relatively short, usually less than 10 years, the period for which a return on capital investment is often evaluated. A planning perspective tends to be associated with the public sector and operates in terms of policies, guidelines, or some other sort of reference point, a concept of what should be. Decisions are made according to whether they move toward this ideal. This perspective tends to have a long-term horizon and involve the consideration of many factors and planning objectives simultaneously. Federal grants play a major role in alternative energy development in Hawaii. Direct or indirect subsidies have underwritten many alternative energy investments in Hawaii, and it is likely that in the future most of the expensive alternative energy investments (including biomass) will likewise require federal subsidy. (The intention of the Reagan administration to reduce federal subsidies for alternative energy development may alter the prospects for some alternative energy projects which have been proposed for Hawaii.) Regardless of federal policies concerning energy subsidies, however, small-scale alternative energy development focused on particular energy needs and capable of paying for itself can be expected to go ahead without federal financing. Because federal policies and fiscal appropriations for energy development are determined in the context of national priorities, and fiscal incentives for energy development follow from those policies, a major portion of Hawaii’s development possibilities are in fact determined outside the state with no particular consideration for the specifics of Hawaii’s needs. One role of Hawaii’s state government in developing energy is to decide which of the existing federal incentives it wishes to take advantage of, as well as new or additional incentives for which it might lobby in Washington. The governor’s office, the state bureaucracy, the state legislature, and private industry each have a role in deciding public policy and investments in alternative energy projects in Hawaii. Public policy is ultimately decided by the governor, and the main function of the state bureaucracy is to implement those policies. The state bureaucracy also provides information and formulates options for the governor, but his decisions are largely a consequence of influence from the legislature, private industry, labor unions, and other advocacy groups. The legislature discusses policy, doing so in response to inputs from the governor’s office, private industry and others. It is through the legislature that environmental groups have the most influence, via legislators who are sympathetic to their positions. “giving due consideration to maintaining the integrity of Hawaii’s natural resources and environmental quality." rational land use (including the maintenance of prime agricultural land in agricultural use). We encountered a number of instances of explicit attention to environmental concerns in biomass energy projects currently underway in Hawaii. An environmental assessment is required for any project supported by public funds. This is the concern of the U.S. Environmental Protection Agency in the case of federally funded developments and of the Hawaii Council of Environmental Quality in the case of state activities. In addition, all developments, whether supported by public funds or not, must adhere to environmental standards, particularly concerning air and water emissions, set and enforced by the Hawaii Department of Health and approved by the U.S. Environmental Protection Agency. We talked with many people involved in biomass energy development in Hawaii in order to establish the way in which environmental concerns are currently brought into the process, and to identify additional ways in which it might usefully be done. We found that environmental considerations were a major concern for nearly everyone involved because of the numerous federal, state, and county regulations intended to protect the environment. People involved in Hawaiian energy development view such considerations primarily in terms of environmental protection, and perceive its major effect on them as being obstructions and delays caused by environmental regulations. They have the same concern for a healthy environment as all citizens but they find the maze of regulations, permits, and assessments at various levels of government to be an encumbrance which costs them time and money. The magnitude of this problem is illustrated by a report of several hundred pages that the Hawaii Department of Planning and Economic Development prepared for dealing with permits and regulations required for alternative energy development.28 The report provides a useful service to developers, by helping them to fulfill legal requirements and avoid meeting unexpected obstacles along the way. People in biomass energy development see environmental concerns largely in terms of pollution, for which federal air and water emission standards already exist. They deal with these standards by seeking the least expensive means of meeting them, but they often perceive the costs as excessive and the standards as arbitrary and unfair. For example, many people consider federal air pollution standards to be more stringent than necessary for Hawaii because the air over the islands is cleansed by Pacific tradewinds. They feel particularly frustrated by alterations in environmental regulations that occur after their commitments have already been made, and which may then change their return on a long-term investment from favorable to unfavorable. Their main concern for improving the way environmental considerations are brought into the development process is expressed by a desire for streamlining the assessment process and establishing “more equitable” bases for emission standards. They feel the extra costs they incur to satisfy emission standards are often -not justified by any public good that may result. In contrast, the priority of people who are active in consumer, environmental; and conservation groups in the state is to preserve unique features of the Hawaiian landscape, the native flora and fauna, and other natural assets of the state. They see a positive value in energy self-sufficiency and fully support it as long as it does not damage those natural and historical assets. Although there is a potential conflict between developers of biomass energy plantations and environmental groups that oppose cutting native forests to establish plantations, no open conflict has developed so far. Present regulations preclude the establishment of tree plantations on lands zoned “conservation district--protective.” The Bioenergy Development Corporation has established an environmental committee (including representatives from conservation groups) to oversee its Eucalyptus plantations, and has not established any plantations on lands where native forests exist. There is considerable-dissatisfaction with environmental assessment and regulation among those who are charged with developing alternative energy sources, but it does not stem from a disagreement with the basic goal of maintaining a healthy environment. The problem seems to be that environmental protection involves a cumbersome maze of legal requirements that are perceived as presenting unnecessary obstacles and delays. A difficulty in coming to grips with what does or does not make sense is that environmental issues are not always precisely stated. These issues are complex, and it is not clear in many cases what the policy conflicts really are. We found issue analysis29 to be a useful tool for putting the information content of an issue into clear perspective. One of the display techniques of issue analysis is an issue tree, which diagrams a hypothetical dialogue. Figures 3 and 6 (pages 21 and 34, respectively) display some of the issues that affect the establishment of energy tree plantations and the production of alcohol waste water, issues that will be discussed in further detail in succeeding-sections of this report. The diagrams proceed as a dialogue, the circles representing one hypothetical person and the squares another. Passing down the tree, each branch gives points that might be made in response to the point immediately above. In this way the overall issue can be analyzed into more detailed issues, and one can see whether the answer to a question is a matter of values or a matter of fact. In the case of facts, it is possible to identify whether they are already known or whether new information is needed that might clarify the issue. In general, there is a progression from policy questions at the top of the tree to management questions farther down and operational questions at the bottom. Figures 3 and 6 raise questions concerning a number of environmental issues, including the need for alternative energy and the ability of new forms of energy to compete economically with sources that are already available. The issues in Figures 3 and 6 and the informational questions that accompany those issues will be discussed further in the sections on land availability, environmental costs and benefits, and stillage handling options. Once the issues are defined, there is a need for a process to translate the bewildering array of environmental information into terms that are meaningful to human welfare and to present the translation in a format comprehensible to people who make decisions. This entire process is an ambitious undertaking, but it becomes more tractable when the steps of the translations are held in mind (Figure 2). The first step is to describe the immediate consequence of a particular activity. This could be the amount of effluent that an alcohol distillery discharges, or the amount of storm runoff that leaves an energy plantation. This is a direct property of the activity itself. Figure 2 - Steps in translating environmental information into human welfare terms. The second step is to determine the impact on the physical environment. This corresponds to “ambient levels” in pollution terminology. Examples are the concentration of pollutants in a particular water body, the peak flood rate during a storm, or the amount of sedimentation that occurs downstream from an erosion area. The impact depends very much upon local conditions: the capacity of the water body to disperse the pollutant or of a watershed to handle flood waters, for example. This step may actually require several stages of translation. For example, it may be necessary to indicate the level of pollutants in the water body and then the effect of those pollutants on the fauna and flora that live in the water. The third step is translation into terms concerning human welfare, such as health, safety, nutrition, aesthetic satisfaction or production of human amenities. This stage can also involve translation into economic terms, such as the decrease in value of properties affected by pollution, the decrease of fish catches due to siltation or pollution, the costs of human health effects, or the cost of damage done by a flood. a The lists in this table are for illustrative purposes only. They are not intended to be exhaustive. Finally, it is useful to have a clear format for presenting environmental information. A common one is a matrix as in Table 1, indicating alternative actions and the impacts each can be expected to have. Although the magnitude of a particular impact might best be expressed in precise quantitative terms, this presents a fundamental problem. Because an environmental assessment done at the early planning stage often applies to a broad range of potential sites with an equally broad range of precise impacts, there are no single quantitative values for impact at a high level of detail. Each impact must therefore be expressed as a range of values. For most practical purposes it is adequate to indicate the impacts in “semiquantitative” terms such as none, low, medium, or high. There appears to be a need for a more flexible format for environmental assessment, eg, one that might be presented in a handbook format that would outline a sequence of tasks leading users step-by-step through an environmental assessment. Users would not start with a preset matrix format but would develop their own as they proceeded through the tasks. We were not able to prepare a full example of this format to include in this report, but many of the ideas that are presented in the working papers could lead to such a handbook. A difficulty with conventional environmental assessment is environmental prediction. The conventional model of environmental assessment requires predictions about the consequences of an activity, such as the establishment of a large-scale energy plantation; the activity then proceeds in a fashion compatible with environmental concerns. Although it may be possible in some instances to say whether there will be a significant impact, in many other instances it may not be. “Adaptive environmental assessment”30 recognizes our limited capability to make environmental predictions and emphasizes monitoring process to see what in fact happens in order to anticipate damaging effects before they occur. It also emphasizes designing an activity to keep open future options to the maximum extent so the activity can be modified to deal constructively with unexpected environmental “surprises” that might turn up. For the discussion following we selected two cases to illustrate how environmental considerations might be brought into the process of biomass energy development: (1) Eucalyptus tree farms, and (2) alcohol stillage handling. Eucalyptus tree farms represent biomass feedstock production, and their environmental concerns are primarily questions of land use. Alcohol stillage is a waste product from a conversion process and concerns water pollution questions. One approach to environmental management is the use of absolute standards for environmental protection.31 Just as an energy investment is not made unless it has at least a certain potential to supply energy and generate profits, it is also not made (or allowed) if environmental damage is likely to surpass certain limits. The environmental standards approach has the advantage that it is relatively easy to put into practice. Standards are set, and public enforcement agencies see that they are met. The energy developer then selects actions to seek maximum profits (or least costs) without violating standards. Benefit-cost analysis is one way to organize information to examine issues. Kasturi has discussed a number of environmental and economic issues associated with energy tree plantation development in Hawaii,33 many of which involve the question “Are tree plantations an environmentally sound land use?” (Some of these issues are illustrated on the right side of Figure 3.) Although properly managed tree plantations are generally a sound land use from an environmental viewpoint, the environmental implications of tree plantations can be assessed only in the context of the relative costs and benefits of such plantations compared with other possible uses for the same land.34 The left side of Figure 3 presents some questions that could arise concerning competition between energy tree plantations and other uses for the same land. Figure 3 - Issue tree diagram of land-use issues concerning energy tree plantations. In the case of the island of Hawaii, the three most important land uses are sugar cane, forest and grazing. Table 2 evaluates each of those uses with respect to energetic, economic, and environmental criteria, and shows the benefits and costs associated with a Eucalyptus energy tree plantation, compared with other uses the land might have before the plantation is placed on it. Table 3 shows the change that would occur if a given amount of land in a particular use were changed to an energy tree plantation. Note that although we have made the evaluations as realistic as possible in the time available, they are for illustrative purposes only. They are not intended to be definitive evaluations of land uses on the island of Hawaii. a Although the entries in this table are as realistic as possible, they are for illustrative purposes only and are not intended to represent authoritative judgments on the relative merits of different land uses. A benefit-cost analysis should not be simply a matter of enumerating benefits and costs. It is also important to indicate to whom the benefits and the costs accrue; that is, who pays and who benefits, and how. One of the most important environmental considerations in a benefit-cost analysis of land use is erosion. Not only does erosion reduce soil fertility at the point where it occurs, it also can cause damage where the soil is deposited. This includes silting streams, rivers, or crops, filling in reservoirs and harbors (thereby increasing dredging costs), killing bottom fauna in coastal waters, and increasing water turbidity, which is objectionable on both aesthetic and biological grounds. In Hawaii, eroded soil can cause siltation damage to coral reefs. Not only may the coral be killed, but there is also a decline in the ecological community that depends upon the coral, including fish of considerable commercial and recreational value. There are well established methods to predict the erosion that will occur with different land uses. The most widely used is the Universal Soil Loss Equation, developed by the U.S. Soil Conservation Service.37 With this equation, the vulnerability of a site to erosion can be evaluated on the basis of soil type, slope, and intensity of rainfall. Thus, inappropriate land uses can be avoided. The erosive effect of different land uses can be evaluated in terms of the protective cover the land uses provide and the benefits to be expected from soil conservation measures such as terracing, strip planting, contour plowing, or water diversion ditches. Although the removal of crop residues for energy purposes can cause serious erosion,38 a properly managed energy tree plantation is a sound land use from a soil conservation viewpoint. Mature tree plantations can provide excellent protection against erosion, although significant amounts of erosion can occur on the roads that supply the plantation and during the period after harvest when the protective cover of the next crop has not yet been established. Tree plantations allow less erosion than conventional agriculture (such as sugar cane) but more than undisturbed forests. Erosion is increased where intensive cultivation practices, such as plowing and weed removal, occur. Another consideration is surface runoff of water and the hazard of flood damage. Surface runoff is evaluated in a fashion similar to erosion, except that soil depth weighs heavily in the formula.39 Even when a crop provides excellent cover, a heavy storm may lead to runoff if the soil is so shallow that it is quickly saturated with water. Excessive runoff is a problem in Hawaii primarily during the occasional heavy storm that occurs only rarely. Because floods can cause millions of dollars in damage, it is particularly important to have a good cover on watersheds above areas of human habitation. Tree plantations can provide excellent watershed cover if properly managed, but if poorly managed the runoff could be considerably greater than that of natural forests. The water budget of a crop indicates whether it is a net water user or water supplier to the water table or streams of the region.40 This is important for regional water budgeting in light of competition between different land uses for limited supplies of water. The greatest contribution to regional water supply will occur if runoff is minimal and the crop itself uses little water. Precipitation, in excess of evapotranspiration, then percolates into and through the soil to recharge the water table or streams. (There are places in Hawaii where there is no water table because water flows underground to the sea, but this concept is of general interest nonetheless.) A crop that requires irrigation is a net user of water. The nutrient budget of a crop indicates the amount of fertilization necessary to maintain it on a sustained basis.41 Nutrients deserve special attention because fertilizers may be as costly as petroleum at some time in the future. Most nitrogen fertilizer is manufactured from petroleum, and all fertilizers have transport costs that depend upon petroleum prices. The nutrient budget also affects the eutrophication load that runoff from agricultural fields places on regional water bodies. They leave the field in surface runoff. This is proportional to the quantity of runoff and the intensity of fertilization. Leaching moves nutrients below the reach of the roots. Nutrients leave the field in the harvest. Nutrients are replenished by natural processes (eg, rainfall, soil weathering, and a variety of microbial processes) and by cultivation practices such as interplanting nitrogen-fixing legumes. The ecological ideal is to have no net loss of nutrients, making fertilizer applications unnecessary to sustain the plantation. Pesticide loads on the environment are proportional to the intensity of pesticide applications and the magnitude of runoff and erosion.44 Pesticide effects are usually greater with more intensively managed plantations (the “agricultural” style discussed in the next section). The combustion of wood from energy tree plantations can contribute to air pollution.45 Air pollution is not generally a problem in Hawaii because of tradewinds that pass across the islands, particularly in leeward areas where offshore winds carry air pollution out to sea. Nonetheless, the boilers at sugar processing plants that would burn wood from Eucalyptus plantations are equipped to maintain their emissions within established national environmental standards. Reversibility is another consideration. Any land use that closes future options for use of that land should be undertaken with caution. Eucalyptus plantations are readily converted to other uses. Some considerations can only be assessed in terms of risk. For example, there is a possibility that a Eucalyptus plantation would be blown down by severe storms that occur occasionally in Hawaii. Fortunately, the blowdown hazard with young plantations of the sort that occur with fast rotations for energy production is not nearly as high as for more mature plantations. One environmental hazard of exotic tree plantations is the possibility that the plants will escape the plantation and become established as a weed. Introduced species are often selected for plantations because they are faster growing than native species, giving them a competitive advantage over native species in areas that are already disturbed. However, the natural mechanisms that hold native species in check in local ecosystems often do not inhibit introduced species. As a consequence, the introduced tree species sometimes spread and take over extensive land areas. This has not been a problem so far with the Eucalyptus that have been introduced for plantation use in Hawaii. Because of the fragile nature of island ecosystems, threatened species and habitats are a major concern in Hawaii, and the Hawaii state government has an explicit policy to conserve its native ecosystems.50 Because the extent of threatened ecosystems is now greatly reduced, conservation organizations in Hawaii take a position against any cutting of native forests. They favor greater energy self-sufficiency in Hawaii and regard properly managed tree plantations as a valuable and environmentally sound land use, provided such plantations do not displace native forests. In contrast, many individuals and companies in the private sector consider the protection of native forests growing on their privately owned land to be an infringement of their rights. Thus, there is a diversity of interests and opinions in the state concerning the protection of .native forests. One way of evaluating the factors in Tables 2 and 3 is to look at trade-offs between the different considerations. Any particular course of action, such as replacing grazing land with a tree plantation (compared to not doing so), will have advantages in some respects and disadvantages in others. The weights that-are assigned to environmental factors relative to one another and to economic and energy considerations are matters of policy and provide the basis for balancing trade-offs. It is the role of the scientist to estimate values like those in Tables 2 and 3. It is for the political process to provide the weights and arrive at decisions. The factors in Tables 2 and 3 might be weighted according to their dollar impact, which is straightforward for economic and energy considerations. The dollar impact of environmental factors is less straightforward. Kasturi has explored dollar values of environmental impacts with examples such as the cost of replacing eroded topsoil, or assessing the dollar value of flood damage.52 Such valuations of environmental impacts must be regarded as experimental. They have the drawback of requiring a large number of arbitrary assumptions, many of which may be hidden from the person who reads such tables. areas with soils of commercial forest quality (ie, soils of sufficient depth). The three maps are overlaid in Figure 4 to form a single map showing areas which are physically suitable for Eucalyptus plantations. The island can also be mapped with respect to the availability of land for energy tree plantations. Only land zoned “agricultural” (the lower left map in Figure 4) is legally available for tree plantations without special petition. Conservation district land subzoned “protective” is not available at all, whereas conservation district lands subzoned “resource” are potentially available upon petition to the Hawaii Land Commission. Turning to practical availability (the lower right map in Figure 4), it is unlikely that land that is already in use for agricultural crops (eg, sugar cane and macadamia nuts) would be converted to energy tree plantations since it would be difficult for such a plantation to yield an economic return competitive with these crops. Legal and practical availability are combined in Figure 4 to give a composite map showing availability from those two points of view. This map in turn is combined with the map of physical ability to indicate the areas that are both suitable and available for Eucalyptus energy plantations. The location of suitable areas can then be compared with locations of the sugar processing plants at which the wood would be burned in order to determine which areas are economically feasible when transport costs are taken into account. The end result would be an idea of how much suitable land is potentially available, and where it .is located. The level of detail in Figure 4 may suffice for general planning and policy purposes, ie, for a broad picture of the possibilities. A more detailed examination would be necessary for management purposes. Not all the land in the areas marked suitable and available in Figure 4 is actually so, because of local variation in soils and other factors affecting physical suitability, and local patterns of land ownership. For example, if a sugar company is planning to establish an energy tree plantation, it might restrict its consideration to land that is already under its ownership. Any larger plantations would likely require cooperation by the owners of several adjacent land holdings. The example presented here is a simple one, but actual suitability map overlays sometimes become so complicated that they are not practical to create manually. Fortunately there are computer programs that sort large numbers of maps and retrieve those portions that pertain to particular criteria for a particular area.56 Any set of overlays can be displayed which can be specified by the “and/or” logic of Boolean algebra, thereby generating new maps for graphic display or storage by computer. Figure 4 - The use of overlays to identify suitable land for Eucalyptus energy plantations on the Island of Hawaii. It is important to emphasize that areas judged suitable and the quantity of land that therefore appears to be available depend upon the nature of the operations that are proposed. For illustrative purposes, one can imagine two styles of energy tree plantations: (1) agricultural tree plantations, and (2) silvicultural tree plantations. An agricultural plantation is farmed by conventional agricultural-practices. The land is plowed in preparation for planting, fertilizers are applied, herbicides are used to control weeds during the establishment of the plantation, the trees are “mowed” rather than harvested singly, and the care is in general as intensive and as mechanized as possible. This kind of plantation is feasible only on high quality agricultural land. The philosophy behind an agricultural energy plantation is that the harvest should be as great as possible in order to assure the economic viability of the enterprise. However, to establish and manage this kind of plantation is quite costly. As a consequence, the value of the harvest even after as long as seven years may not be sufficient to attain the profit (typically 20 percent per year) that private industry expects from such a large investment. A silvicultural plantation receives less intensive care. It is not restricted to prime agricultural land, being feasible on any lands of commercial forest quality. These are lands that have sufficient rainfall and soil depth to support reasonably rapid tree growth, which, in the case of silvicultural plantation development by the state government in Hawaii, is at least 9 m3 per .4 hectare in eight years. A third kind of energy plantation can grow on marginal land. Euphorbia, for example, produces hydrocarbons that can be used directly as gasoline substitutes without conversion to alcohol.57 The location of marginal lands suitable for this kind of plantation would be quite different from those shown for commercial forests in Figure 4. As we have noted, the amount of land available for energy plantations depends not only upon physical suitability and legal availability, but also upon existing uses that the plantation might displace. Although maps are useful for deciding where energy farms may be located, they may not be effective summaries for policymakers who want to see possibilities and trade-offs without being distracted by the detail of a map. The question, “How much land is available?” may best be answered without regard to where the land is located. Another approach is to use diagrams to summarize the amounts of available land in different suitability and present use categories. Figure 5 is based upon a detailed classification of the land on Hawaii and its suitability for different uses.58 The outer circle represents the total amount of land on the Island of Hawaii. The innermost circle (labeled “agriculture”) indicates the acreage of high quality agricultural land available. 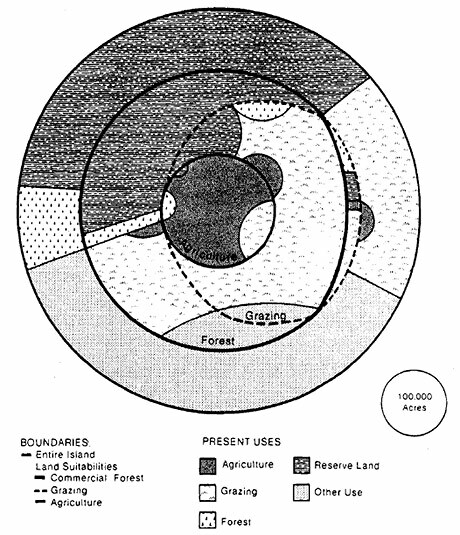 The circle labeled “grazing” indicates the quantity of high quality grazing land, and the circle labeled “commercial forest” represents the quantity of land that will sustain commercial levels of tree growth. The outer ring of the diagram represents land that is not particularly suitable for any of the uses presented in the diagram. Figure 5 - A diagrammatic approach for displaying the availability of land for energy tree plantations on the Island of Hawaii. Note that the agricultural circle is inside the other circles, indicating that all of the agricultural land is also suitable for grazing or commercial forest. Most of the land that is highly suitable for grazing is also suitable for commercial forest (the overlap of the grazing and forest circles); and considerable amounts of land exist that are suitable for commercial forest but not for grazing. The different textured areas in Figure 5 represent the current uses of lands in these different suitability categories. One can see that most of the land suitable for agriculture is already used for agricultural crops (almost entirely for sugar cane). Grazing dominates the scene outside agricultural lands. The land suitable only for grazing is almost entirely in grazing use, and the land suitable for both commercial forest and grazing is also used primarily for grazing. Even land suitable only for commercial forests, which is marginal for grazing, is used largely for grazing. As a consequence, most of the exploitable forests are found on land which is not of commercial forest quality (the outer ring of the diagram). The circle beside the diagram is for scale, representing 100,000 acres (40,000 hectares). If an energy tree plantation were agricultural in style, therefore requiring land highly suitable for agriculture, 100,000 acres would occupy nearly all of the suitable land and displace nearly all of the existing agriculture. If it could not displace existing agriculture, there is very little land available (the area in the inner circle not in agricultural use). If a silvicultural style were contemplated, the availability of land is much greater, lying anywhere within the circle labeled commercial forests. The “reserve” land in that circle is not legally available for plantation use, but there are several hundred thousand acres of land suitable only for commercial forest but now used for grazing. This land, which is marginal for grazing, might be the best to use for new silvicultural energy plantations with a minimum disruption to existing valuable land uses. For a marginal land plantation, one sees there is considerable land available in the outer ring. But since some of the land in the outer ring is too barren even for marginal plantation, it would be necessary to draw a new suitability circle tailored to the needs of marginal land plantations. With a diagram like Figure 5, one can visualize the scale of energy plantation which could be established without causing serious disruptions of other important land uses. Different diagrams can be prepared for different styles of energy plantations, thereby allowing an evaluation of the land-use implications of the different styles. Competition between energy plantations and food or fiber production that might take place on the same land is a serious consideration in many areas. There is no significant potential for competition between Eucalyptus plantations and food production in Hawaii because there is no significant food production in the state aside from export crops like sugar, pineapple, and macadamia nuts. However, competition between energy, plantations and food could be more serious in other places.59 For example, in the midwestern United States, corn intended to be fermented to alcohol could otherwise be fed to pigs or exported to nations with food shortages. Sugar cane or cassava for an alcohol crash program in a developing country might be produced on land that would otherwise be used for subsistence agriculture. Stillage is the liquid waste from an ethanol distillery, with thirteen gallons of stillage produced for every gallon of alcohol. The addition of stillage to a body of water can increase its biological production, an effect that may or may not be desirable, depending upon circumstances. Stillage does not contain toxic substances, but it does have an exceedingly high biological oxygen demand (a BOD 200 times that of raw sewage) due to the high concentration of dissolved solids.60 This means that even though the volume of stillage waste may not be great compared to the volume of other industrial or municipal liquid wastes, its BOD can be quite significant. Table 4 lists environmental impacts of stillage disposal into a body of water. If one compares the per capita production of sewage with the per capita consumption of gasoline in Hawaii, the BOD in the stillage from producing alcohol to replace all the state’s gasoline would be 30 times the BOD the state now produces in sewage. There are no plans to substitute all of Hawaii’s gasoline with alcohol, but even a 10 or 20 percent substitution, as with gasohol, would increase the BOD load of the state to several times what it is now. This could present a massive disposal problem if the stillage is not converted to useful products. The stillage handling problem has been largely neglected in the numerous reports on biomass energy and alcohol fuels, including those with an environmental assessment focus. Stillage typically receives scant attention, indicating that the volume of stillage is not large compared to liquid wastes resulting from other industrial processes, that the technology already exists for dealing with stillage, or that it can be handled by conventional sewage treatment. Conventional sewage treatment of stillage would result in an environmentally clean product, but is very expensive. It would require substantial expansion of existing treatment facilities and could increase the production cost of the alcohol by as much as 20 percent. Until recently, nearly all ethanol produced in the United States by fermentation was made for beverage purposes, using grain as a feedstock. The stillage is concentrated by evaporation and sold for animal feed. But ethanol for energy would have to be produced on a much larger scale and the animal feed market might become saturated. Furthermore, a large percentage of that ethanol would be produced from other feedstocks such as sugar, molasses, or cassava, and, the properties of the market for animal feed from stillage based on those feedstocks are not yet known. . Discharge to an adjacent waterway or land area. Marine outfall (discharge a substantial distance from shore). Anaerobic digestion (and production of methane). Incineration to an ash to be used as fertilizer. Evaporation to an animal feed. Babor and Willington and Marten have discussed in detail each of these options, which vary enormously in their environmental characteristics, whether they are commercially proven, whether they consume or produce energy, whether they lead to useful by-products, and whether they cost or generate money.61 Figure 6 illustrates some of the trade-offs between these options, the basic trade-offs being between capital investment and other economic considerations, energy costs, and environmental costs. The characteristics of the stillage handling options are summarized in Table 5.
a Although the entries in this table are as realistic as possible, they are for illustrative purposes only and are not intended to represent authoritative judgments on the relative merits of stillage handling options. Stillage handling options requiring the smallest capital investment involve discharge of one sort or another. Of these, the least expensive is discharging directly from the distillery, but this may have serious environmental consequences. Somewhat more expensive is discharge from an ocean outfall. This may or may not have damaging effects, depending upon local conditions (currents and underwater topography). Somewhat more expensive is redistribution of stillage to agricultural fields. This has the advantage of using plant nutrients and soil conditioners that are in the stillage, but it has the hazard of toxic effects (overfertilization) from excessive application. Toxicity effects from field application can be minimized by distributing the stillage over a large area of fields (ideally as large as the area supplying the distillery with feedstock), but this means more investment and expense for a distribution system unless a large-scale irrigation system is already in place. Useful products can be extracted from stillage, but the capital cost is considerably greater than for simple disposal, often equal to the cost of the distillery itself. Incineration utilizes the stillage energy content, which can supply some of the energy needs of the distillery. Incineration also yields a high-potassium ash which can be used for fertilizer. Anaerobic digestion yields energy in the form of methane. Evaporation yields a syrup that can be sold for animal feed. The capital costs of evaporation are not as high as for incineration and anaerobic digestion, but evaporation uses energy instead of generating it. Marine outfall, incineration; and evaporation are all being considered for distilleries that may be built in Hawaii. Although a marine outfall could be the least expensive, there may be problems due to Hawaii’s offshore currents and underwater topography, which may not allow sufficient dispersion of the pollutants. Since there is a desire in Hawaii to utilize the potential by-products from stillage, evaporation to animal feed seems to be the promising alternative at this time.62 The Hawaiian molasses that would be used to make alcohol is now sold for animal feed on the mainland. There is the problem that molasses-based stillage contains a high potassium content not present in molasses; this reduces the value of molasses stillage for animal feed, but at least some markets appear to be available. The evaporation option has the advantages of reasonably low capital investment and straightforward technology. It has the disadvantage of high energy requirements. The evaporation and distillation processes would probably be fueled by coal, with the result that the net energy production of Hawaiian alcohol would be significantly negative. It would be a conversion from readily available imported coal energy to less available liquid fuel. What are the markets for by-products such as methane, fertilizer, or animal feed? Am I willing to risk a process which is not commercially proven? Is it necessary that the process pay for itself? Must the process be self sufficient in energy? Is the distillery serving a large area or a small area? Can the distillery be located near the ocean? Although the answers to these questions should suggest which stillage option is most appropriate, there will not necessarily be a simple solution. It is quite possible that no stillage option will perfectly fit a particular case. This means it is necessary to return to the questions and decide where one is willing to make compromises among the kinds of considerations shown in Table 5. Compromises are matters of policy, and a realistic policy can be shaped only to the extent that the practical possibilities for stillage handling are dealt with explicitly and realistically at the beginning of the development process. A technical clearinghouse for stillage processing. There are numerous commercial systems for processing alcohol stillage that are now in varying stages of development in different parts of the world. Many have been adapted from processes already in use for other industrial effluents with similar properties. Some are already in use, others are only in the pilot phase, and still others are in the laboratory development phase. The manufacturers and developers of these systems make varying claims about them. It is difficult for anyone who is deciding how stillage should be handled to know what systems are available and which of them are most appropriate for particular circumstances. It is very likely that decisions will often be made on the basis of partial information because it would be very difficult and expensive for a lone distillery to make a comprehensive survey of stillage systems. This would be particularly true in a crash program where there is little time and limited professional manpower to assemble information. There is therefore a need for an information clearinghouse for stillage handling technology. This information should be in terms of specific equipment and processing systems that are available or under development. Information about each system should be documented with respect to the capital costs of the equipment, the kinds of stillage (with respect to distillery feedstock) the process handles, the energy budget of the process, and the characteristics of its products. The information should allow persons who are setting up a new distillery to evaluate different stillage handling systems with respect to their particular circumstances, to match it to the sources of energy available, calculate costs in terms of the energy and other requirements of the system, evaluate by-products with respect to local markets, and evaluate emissions with respect to local environmental standards. At a national level, this information could be used to determine the feasibility of establishing alcohol distilleries on a large scale. There is not at the moment any established clearinghouse for this kind of information. Nonetheless, a solid foundation has been laid for establishing such a facility as a consequence of the study conducted by the Hawaii Natural Energy Institute and the Hawaiian Sugar Planters Association.63 Since there are numerous systems that have not yet been catalogued and described in a manner useful for planning and developing large scale alcohol production, there is an opportunity to do this in a way that could have significant impact on liquid fuel development. For purposes of both national and international planning there is a need for an inventory and summary of renewable energy resources in the Asia-Pacific region. This summary could be in the form of a “renewable energy atlas.” The discussion following will be restricted to the biomass energy portion of such an atlas. The potential for biomass energy production in a given area depends upon the amount of land in that area that is physically suitable for energy farms and practically available for such use. The amount of available land cannot be represented by a single figure, however, because the biomass energy potential of an area depends upon (1) the kind of energy farm to be employed, and (2) the extent to which energy farms would be allowed to replace other forms of production from the land (eg, food and fiber). The production potential can be represented by means of a diagram like that in Figure 5. This information will be particularly useful to national planners and to policymakers in the legislative and executive branches of government. A compilation of diagrams of this sort for the numerous countries in the Asia-Pacific region that are developing biomass energy would yield an international picture of the potential of this resource and the implications for developing that potential in terms of sacrifices that would have to be made in other products from the land. Proper information for such diagrams could be assembled only by people who live in the area in question and understand it thoroughly, thus the preparation of an atlas would require full participation from each of the countries involved. Although we encountered many people with strong feelings, often negative, about environmental assessment, we also observed that most did not know much about it. There is a need for training workshops to teach people who are involved in all aspects of energy development more about the environmental assessment process. Using case studies, such workshops could provide experience and practice in environmental assessment, including an appreciation for the information requirements at different levels and different stages of the process, and the roles of different people involved.64 Particularly important is to develop a feeling for the specific information requirements and responsibilities of different people in the process. Analyzing a natural resource or environmental management situation. Defining key issues (biological. social and economic). Assessing the technical capability required to undertake environmental assessment. Selecting the most appropriate methods and procedures for environmental assessment. Understanding and influencing other groups involved in the management and decision-making process. Mulcock has described a role-playing exercise that could form the basis for such a workshop.65 The exercise postulates that a sugar company is considering the establishment of tree plantations to supplement its energy needs. Participants in the exercise take part as members of the company’s executive board, its management team, or an environmental consulting firm. The process is initiated by management’s intention to establish tree plantations to produce fuel for their sugar processing plant and a request by management to the consulting firm to know what they should do for an environmental assessment. The consulting firm has to come up with an environmental assessment plan that meets the needs of management, and management in turn has to convince the board that this plan is in the interest of the company. The outcome of the exercise is that each participant comes to appreciate the goals, responsibilities, and information needs of each of the three parties (environmental assessors, management, and executive decision makers) in a biomass energy development process. Such workshops can serve not only as a means to improve environmental awareness but also as a means for environmental scientists to work with people who are actually involved in energy development. This kind of interaction also can be a step toward improved procedures for environmental assessments. Problem and issue identification for environmental assessment. Limitations in defining beneficial and adverse consequences of development projects. Features of a project which might produce adverse environmental effects. Interpretation of information from different sources and levels. Measures that can be taken to mitigate potential environmental effects. We encountered considerable interest in how to assess environmental costs and benefits realistically. We found an interest in the public sector from a planning viewpoint, and an interest in the private sector from the viewpoint of environmental regulations and environmental standards. Upon attempting a benefit-cost analysis ourselves (on Eucalyptus plantations), we found that there are not well established techniques for evaluating many of these costs and benefits, and people are not prepared to accept figures that come from techniques they do not understand or that they feel have value judgments imbedded in the calculations. There is a need to develop “transparent” benefit-cost analyses, where the basis for the final figures is readily understood by the user of the results and where he has a feeling of participation by being able to select between alternative figures on the basis of his judgments concerning steps along the way. However, because environmental benefit-cost analysis is far from a routine matter at the present time, we cannot recommend that such analyses be pursued on a routine basis. It would be useful to undertake benefit-cost analyses of additional case studies, in order to clarify the extent to which existing techniques are appropriate and to identify new techniques that need development in order to bring environmental benefit-cost considerations more effectively into energy policy decisions. There is a large and expanding body of literature that describes and analyzes the numerous and complex environmental considerations in biomass energy development. There is a need for simple translations of those considerations to human welfare terms, so they are comprehensible to people who must then take them into account when determining energy policy or making biomass investment decisions. The view that environmental regulations should be streamlined is widely held. Many people who are concerned with developing energy do not have valid ideas of what is involved in environmental assessment. There is a need for workshops to instill a more realistic appreciation of this area. Because of the large amount of land required to produce significant amounts of biomass energy, many of the environmental issues for biomass energy development involve questions of land use. Land use implications of biomass have received considerable attention in the literature, but .land use is so complex an issue that it is difficult to incorporate effectively into decisions of energy development. There is a need for simple; graphic presentations to put land use issues into clear perspective, including the amount of land potentially available for biomass energy farms and the extent to which large-scale biomass production could be achieved, but only at the expense of using the land in other valuable ways. The handling of alcohol stillage is a process that has important environmental implications but that has not received the attention it deserves. There is a need for an information clearinghouse to catalog and distribute materials on existing and upcoming commercial stillage handling process, so alcohol production planning can take into account the full range of techniques and means available. R. Revelle, Energy dilemmas in Asia: The need for research and development, Science 209 (4 July 1980): 164-174. Solar Energy Research Institute, Biomass: Solar Energy from Farms and Forests (Golden, Colo.: Solar Energy Research Institute, 1979). MITRE Corporation, Silvicultural biomass farms, 5 vols. : I. Summary, II. The biomass potential of short rotation farms, III. Land suitability and availability, IV. Site specific production studies and cost analysis, V. Conversion process and cost. MITRE Tech. Report 7347, Springfield, Va. (reproduced by NTIS, 1976). D. E. Earl, Forest Energy and Economic Development (London: Clarendon Press, Oxford University Press, 1975). U.S., Dept. of Energy, Fuels from biomass program. DOC /ET-0022, Washington, D.C., 1978. Philippines, Ministry of Energy, Ten year energy program 1980-1989. Manila, Philippines, 1980. A. Martono, Energy and environment in Indonesia. Paper presented to East-West Environment and Policy Institute Workshop on Environmental Dimensions of Energy Policies, 26 March-6 April 1980. Mimeo, Research Materials Collection (Energy/Indonesia), Environment and Policy Institute, Honolulu, Hawaii, 1980. New Zealand, Energy Research and Development Committee, The potential of energy farming for transport fuels in New Zealand, Auckland, New Zealand, 1979. V. Yang and S. C. Trinidade, The Brazilian gasohol program, Development Digest 17(1979): 12-24. Hawaii, Dept. of Planning and Economic Development, State energy plan: A state functional plan prepared in accordance with chapter 226, Hawaii revised statutes. Honolulu, Hawaii, 1980. Stanford University and University of Hawaii, Biomass energy for Hawaii (4 vols. : I. Summary and background, II. Sugar operations, III. Mixed municipal refuse, IV. Terrestrial and marine plantations). By Biomass Energy Study Team, Institute for Energy Studies, Stanford University and Hawaii Natural Energy Institute, University of Hawaii, 1977. Hawaii, Dept. of Planning and Economic Development, and Lawrence Laboratory (Berkeley, California), Hawaii integrated energy assessment, (6 vols. : I. Executive summary, II. Alternate energy technologies for Hawaii, III. Projecting Hawaii’s energy future: Methodology and results, IV. Energy data handbook, V. Rules, regulations, permits and policies affecting the development of alternative energy sources in Hawaii, VI. Perceptions, barriers, and strategies pertaining to the development of alternate energy sources in the state of Hawaii). Honolulu, Hawaii, and Berkeley, California, 1981. See Hawaii Natural Energy Institute Annual Reports, and Hawaii Natural Energy Institute Newsletters, 1979-1981. University of Hawaii, Honolulu, Hawaii, 1979-1981. Hawaii, State Senate, Legislative Energy Handbook (2 vols. ).For Committee on Economic Development and Energy, ed. by T. C. Yim, Honolulu, Hawaii, 1979. U.S., Environmental Protection Agency. Preliminary environmental assessment of biomass conversion to synthetic fuels. Report No. EPA-600/7-78-204, by Batelle Laboratories (Columbus, Ohio). Washington, D.C., 1978. U.S., Energy Research and Development Administration, Solar program assessment: Environmental factors, fuels from biomass. Report No. ERDA-77-4717, Washington, D.C., 1977. U.S., Dept. of Energy, Environmental development plan: Biomass energy systems. Report No.DOE/EDP-0032, Washington, D.C., 1979. C. E. Calef, An environmental critique of solar power by bioconversion methods. Report No. BNL-21955, Brookhaven National Laboratory, Upton, N.Y., 1978. P. Holdren, G. Morris and S. Tanenbaum, Environmental aspects of alternative energy technologies for California. Energy. and: Resources Group, University of California, Berkeley, 1978. Dept. of Energy, Environmental data for energy technology policy analysis. MITRE Corporation Report No. HCP/EV-6119, Springfield, Va. (reproduced by NTIS), 1979. G. Morris, Integrated assessment issues raised by the environmental effects of biomass energy systems: A case study. Report No. ERG-WP-80-6, for Energy and Resources Group, University of California, Berkeley, California, 1980. New Zealand, supra n. 3. H. M. Braunstein, P. Kanciruk, R. D. Roop, F. E. Sharples, J. S. Pattum, K. M. Oakes, Biomass Energy Systems and the Environment. (Oxford: Pergamon Press, 1981). W. R. H. Perera, Biofuel systems and plantations--Energy farms: Their environmental implications. Working Paper, East-West Environment and Policy Institute, Honolulu, Hawaii, 1979. U.S., Environmental Protection Agency, Land Use and the Environment: An Anthology of Readings. Office of Research and Monitoring, Environmental Studies Division, Washington, D. C., 1979. Australia, Dept. Home Affairs and Environment, The environmental implications of alcohol fuel production from biomass and their bearing on energy research and development programs. Environmental Studies Paper No. I/EI-7, by I. Gorie. Canberra, Australia, 1980. Hawaii, Dept. of Planning and Economic Development, and Lawrence Laboratory (Berkeley, California), supra n. 4. Honolulu, Dept. of Public Works, Environmental impact statement preparation notice for the proposed program of waste energy recovery (HPOWER). Honolulu, Hawaii, 1979. See L. D. Pryor, The biology of Eucalyptus, Study in-Biology, No. 61 (1976). Bioenergy Development Corporation, Environmental assessment. Mimeo, 1979. Hawaii, Dept. of Land and Natural Resources, Forest potentials for Hawaii. Honolulu, Hawaii, 1976. Hawaii, Dept. of Planning and Economic Development, EIS Handbook for Hawaii. By R. J. Scudder. Honolulu, Hawaii, 1979. County of Maui, Ofc. of Energy Coordinator, Summary of an action program for Molokai electrical energy self-sufficiency by 1983. Mimeo, University of Hawaii, Hawaii Natural Energy Institute, 1979. J. L. Brewbaker and E M. Hutton, Leucaena--versatile tropical tree legume, in G. A. Ritchie, ed., New Agricultural Crops, pp. 207-258. Hawaii, Ofc. of Environmental Quality Control, Field tests on ambient air dried pineapple plants for use as a solid waste fuel for biothermal electrical generation. Report by J. Crouch. Honolulu, Hawaii, 1980. J. L. Brewbaker, ed., Giant Leucaena (Haole Koa) Energy Tree Farm: An Economic Feasibility Analysis for the Island of Molokai, Hawaii (Honolulu: University of Hawaii, Hawaii Natural Energy Institute, 1980). T. C. Yim, supra n. 4. Stanford University/University of Hawaii Biomass Energy Study Team, supra n. 4, vol. 4. .
Hawaii, Dept. of Planning and Economic Development; Ethanol/gasohol for Hawaii. Honolulu, Hawaii, 1980. Hawaii Natural Energy Institute, Hawaii ethanol from molasses, project phase I: final report. University of Hawaii, Honolulu, Hawaii, April 1980. D. L. Marzola and D. P. Bartholomew, Photosynthetic pathway and biomass energy production, Science 205 (1979):555-559. Hawaii, Dept. of Planning and Economic Development and Lawrence Laboratory (Berkeley, California), supra n. 4. Hawaii, State Environmental Council, Hawaii’s environment 1979. Honolulu, Hawaii, 1980. S. M. Siegel and B. Z. Siegel, An Environmental Overview Program for Land-Based Alternate Energy Development (Honolulu: University of Hawaii, Pacific Biomedical Research Center, 1980). Hawaii, Dept. of Planning and Economic Development and Lawrence Laboratory (Berkeley, California), supra n. 4, vol. 5. D. Wojik, Issue Analysis: An Introduction to the Use of Issue Trees and the Nature of Complex Reasoning, Mimeo, 48 pp., Carnegie-Mellon University, Pittsburgh, 1975. C. S. Holling, ed., Adaptive Environmental Assessment and Management (New York: John Wiley & Sons, 1978). T. A. Siddiqi, R. A. Carpenter, and M. Hufschmidt, eds., Environmental standards and energy policies: 9-21 March 1980 Workshop Report. Environment and Policy Institute, Honolulu, Hawaii, January 1981. Introduction. W. E. Westman, How much are nature’s services worth? Science 197(1977):960-964. M. Hufschmidt and E. Hyman, eds., Economic Approaches to Natural Resource and Environmental Quality Analysis (Bray, County Wicklow, Ireland: Tycooly International Ltd., 1981). P. Kasturi, The environmental/socioeconomic interface of biofuel development in Hawaii: Silviculture on the slopes of Mauna Kea and Mauna Loa. Working Paper, East-West Environment and Policy Institute, Honolulu, Hawaii, 1981. G. G. Marten and L. Sancholuz, Ecological land use planning and carrying capacity evaluation in the Jalapa region (Veracruz, Mexico), Agroecosystem. (forthcoming, 1982). G. G. Marten, Simulation games, overlays, computer graphics and other visual means for demonstrating the environmental consequences of land use. East-West Environment and Policy Institute, Honolulu, Hawaii, 1980. R. W. Chambers et al., Gasohol: Does it or doesn’t it produce positive net energy? Science 206 (1979): 789-795. D. A. Huettner, Net energy analysis: An economic assessment, Science 192 (1976): 101-104. P. Kasturi, An assessment of Hawaii’s biomass energy options: Economics and policy (Proceedings of the Third Miami International Conference on Alternate Energy Sources). Working Paper, East-West Environment and Policy Institute, Honolulu, Hawaii, 1981. U.S., Dept. of Agriculture, Predicting rainfall erosion losses: A guide to conservation planning. Agric. Handbook No. 537 by W. H. Wischmeier and D. D. Smith. Washington, D.C. 1978. S. A. El-Swaify et al., Soil Erosion by Water in the Tropics: A State of the Art (Honolulu: University of Hawaii Press, 1981). U.S., Dept. of Agriculture. Erodibility of selected Hawaii soils by rainfall simulation. Agricultural Research ServiceDocument No. ARS-W-35, by E. W. Dangler et al. Washington, D.C., May 1976. pp. 14 and 46. M. J. Lindstrom, E. L. Skidmore, S. C. Gupta and C. A. Onstad, Soil conservation limitations on removal of crop residues for energy production, J. Environ. Qual. 8 (1979): 533-537. U.S., Soil Conservation Service, Estimating runoff, in Engineering Field Manual, Washington, D.C., 1971. Chapter 2. U.S., Dept. of Agriculture, Control of water pollution from cropland, Vol. 1, A manual for guideline development. Report No. ARS-H-5-1, by B. A. Stewart et al. Washington, D.C., 1975. H. C. Pereira, Land Use and Water Resources in Temperate and Tropical Climates (Cambridge: Cambridge University Press, 1973). E. G. Farnworth and F. B. Golley, Fragile Ecosystems (New York, Heidelberg, Berlin: Springer Verlag, 1974). H. M. Braunstein et al., supra n. 5. L. Christanty Widagda, Biophysical and environmental constraints of the plantations in Hawaii. Working Paper, East-West Environment and Policy Institute, Honolulu, Hawaii, 1981. W. A. Brown, Ecology of Pesticides (Chichester, Brisbane, Toronto: John Wiley & Sons, 1978). R. R. Bruce et al., A model for runoff of pesticides from small upland watersheds, J. Environ. Qual. 4(1975):541-548. U.S., Environmental Protection Agency, Compilation of air pollutant emission factors. EPA Report AP-42, Washington, D.C., 1977. O. L. Louks, Recent results from studies of carbon cycling in the biosphere. Mimeo, The Institute of Ecology, Indianapolis, Indiana, 1980. U.N., UNESCO/UNDP/FAO, Pest and diseases in forest and plantations, in Tropical Forest Ecosystems (Rome: FAO, 1978). pp. 287-308. C. S. Hodges, U.S. Forest Service, Honolulu, Hawaii. Personal communication, 1980. W. E. Hillis and A. G. Brown, Eucalyptus for Wood Production (Canberra, Australia: Department of Science, Commonwealth Science and Industrial Research Organization [CSIRO], 1978). C. S. Hodges, The Implications of Diseases and Insects in the Management of Tropical Forests, paper presented at Symposium on Forest Sciences and Their Contribution to Development in Tropical America, University of Costa Rica, San Jose. M. Kaplan et al., Report to the People: Hawaii’s Vulnerable Environments. Technical Report 2 (Honolulu: Hawaii Land Use Commission, 1975). S. Schauman, Landscape visual resources, Council of Planning Librarians’ Exchange, Bibliography No. 938 (Monticello, Ill.: Council of Planning Librarians, 1975). I. McHarg, Design with Nature (New York: Doubleday, 1971). P. Kasturi, supra n. 33, Appendix, Environmental benefit-cost analysis for land use. D. E. Dowall, U.S. land use and energy policy: Assessing potential conflicts, Energy Policy (March 1980):50-60. U.S., Dept. of Energy, The Eucalyptus energy farm: Feasibility study and demonstration, Phase I: Site and species selection (for Marelco, Inc.). Report No. HCP/T2557-1 by E. O. Mariani et al. for Ofc. of Energy Technology, Division of Solar Technology (Washington, D.C., 1978). See also supra n. 34. D. A. Lewis, Environmental land use planning for energy·tree plantations. Unpublished manuscript, East-West Environment and Policy Institute, Honolulu Hawaii, 1981. U.N., A framework for land evaluation, Soils Bulletin No. 32 (Rome: FAO, 1976). L. D. Hopkins, Methods for generating land suitability maps: A comparative evaluation, AIP Journal 43 (October 1977):386-400. R. A. Carpenter, ed., Assessing Tropical Forest Lands: Their Suitability for Sustainable Uses (Bray, County Wicklow, Ireland: Tycooly International Ltd., 1980). U.S., Fish and Wildlife Service, PAN: A refuge resource planning general information system. By Systems Application Group, Western Energy and Land Use Team. Fort Collins, Colorado, 1980. P. E. Nielson et al., Plant crops as sources of fuel and hydrocarbon-like materials, Science 198 (1977):942-944. L. R. Brown, Food or fuel: New competition for the world’s cropland. Worldwatch Institute Paper no. 35, Washington, D.C., 1980. C. S. Barnes and E. J. Hobert, Alcohol manufacture--wastewater treatment, Water 6(4) (December 1979):22-23. D. C . Babor, The stillage question in fuel ethanol programs: Alternative management schemes. Working Paper, East-West Environment and Policy Institute, Honolulu, Hawaii, 1981. I. P. Willington and G. G. Marten, Options for handling stillage waste from sugar-based fuel ethanol production, Resource Conservation (forthcoming, 1982). F. H. Hubbard, ed., Natural systems management for development, report from the East-West Environment and Policy Institute workshop on training for natural systems management, October 22-November 2, 1979 (Honolulu, Hawaii: East-West Environment and Policy Institute, 1980). C. Mulcock, A teaching exercise for environmental assessment. Working Paper, East-West Environment and Policy Institute, Honolulu, Hawaii, 1981. R. Stubbs and F. S. Verzosa, eds., Explorations in Large-Scale Administrative Systems (Manila: Development Academy of the Philippines, 1981). Braunstein, H. H. et al. 1975. Biomass Energy Systems and the Environment. Oxford: Pergamon Press. Brewbaker, J. L., ed. 1980. Giant Leucaena (Haole Koa) Energy Tree Farm: An Economic Feasibility Analysis for the Island of Molokai, Hawaii. Honolulu: Hawaii Natural Energy Institute, University of Hawaii. Brown, A. W. A. 1978. Ecology of Pesticides. Chichester, Brisbane, Toronto: John Wiley & Sons. Carpenter, R. A., ed. 1980. Assessing Tropical Forest Lands: Their Suitability for Sustainable Uses. Bray, County Wicklow, Ireland: Tycooly International Ltd.
Earl, D. E. 1975. Forest Energy and Economic Development. London: Clarendon Press, Oxford University Press. El-Swaify, S. A. et al. 1981. Soil Erosion by Water in the Tropics: A State of the Art. Honolulu: University of Hawaii Press. Farnworth, E. G. and Golley, F. B. 1974. Fragile Ecosystems. New York, Heidelberg, Berlin: Springer Verlag. Hillis, W. E, and Brown, A. G. 1978. Eucalyptus for Wood Production. Canberra, Australia: Commonwealth Scientific and Industrial Research Organization (CSIRO). Holling, C. S., ed. 1978. Adaptive Environmental Assessment and Management. New York: John Wiley & Sons. Hufschmidt, M. and Hyman, E., eds. 1981. Economic Approaches to Natural Resource and Environmental Quality Analysis. Bray, County Wicklow, Ireland: Tycooly International Ltd.
McHarg, I. 1971. Design with Nature. New York: Doubleday. Pereira, H. C. 1973. Land Use and Water Resources in Temperate and Tropical Climates. Cambridge: Cambridge University Press. Solar Energy Research Institute. 1979. Biomass: Solar Energy from Farms and Forests. Golden, Colo.: Solar Energy Research Institute. Stewart, G. A. et al. 1979. The Potential for Liquid Fuel from Agriculture and Forestry in Australia. Canberra, Australia: Commonwealth Scientific and Industrial Research Organization (CSIRO). Stubbs, R., and Verzosa, F. S., eds. 1981. Explorations in Large-Scale Administrative Systems. Manila: Development Academy of the Philippines. Babor, D. C. 1981. The Stillage Question in Fuel Ethanol Programs: Alternative Management Schemes. Working Paper, East-West Environment and Policy Institute, Honolulu, Hawaii. Barnes, C. S., and Hobert, E. J. 1979. Alcohol Manufacture--Wastewater Treatment. Water 6(4) (December):22-23. Bioenergy Development Corporation. 1979. Environmental Assessment. Brown, L. R. 1980. Food or Fuel: New Competition for the World’s Cropland. Worldwatch Institute Paper No. 35, Washington, D.C.
Bruce, R. R. et al. 1975. A Model for Runoff of Pesticides from Small Upland Watersheds. J. Environ. Qual. 4:541-548. Calef, C. E. 1978. An Environmental Critique of Solar Power by Bioconversion Methods. Brookhaven National Laboratory Report BNL-21955. Chambers, R. W. et al. 1979. Gasohol: Does it or Doesn’t it Produce Positive Net Energy? Science 206:789-795. Dowall, D. E. 1980. U.S. Land Use and Energy Policy: Assessing Potential Conflicts. Energy Policy 8 (March):50-60. Hodges, C. S. 1979. The Implications of Diseases and Insects in the Management of Tropical Forests. Paper presented at Symposium on Forest Sciences and Their Contribution to Development in Tropical America, University of Costa Rica, San Jose. Holdren, J. P., Morris, G., and Tanenbaum, S. 1978. Environmental Aspects of Alternative Energy Technologies for California. Energy and Resources Group Report, University of California, Berkeley. Hopkins, L. D.1977. Methods for Generating Land Suitability Maps: A Comparative Evaluation. AIPJournal 43 (October):386-400. Hubbard, F. H., ed. 1980. Natural Systems Management for Development, Report from the East-West Environment and Policy Institute Workshop on Training for Natural Systems Management, October 22-November 2, 1979. (Unpublished.) East-West Environment and Policy Institute, Honolulu, Hawaii. Huettner, D. A. 1976. Net Energy Analysis: An Economic Assessment. Science 192:101-104. Kasturi, P. 1981. An Assessment of Hawaii’s Biomass Energy Options: Economics and Policy (Proceedings of the Third Miami International Conference on Alternate Energy Sources). Working Paper, East-West Environment and Policy Institute, Honolulu, Hawaii. _____. 1981. The Environment/Socioeconomic Interface of Biofuel Development in Hawaii: Silviculture on the Slopes of Mauna Kea and Mauna Loa. Working Paper, East-West Environment and Policy Institute, Honolulu, Hawaii. Lewis, D. A. 1981. Environmental Land Use Planning for Energy Tree Plantations. Unpublished manuscript, East-West Environment and Policy Institute, Honolulu, Hawaii. Lindstrom, M. J., et al. 1979. Soil Conservation Limitations on Removal of Crop Residues for Energy Production. J. Environ. Qual. 8: 533-537. Louks, O. L. 1980. Recent Results from Studies of Carbon Cycling in the Biosphere. Mimeo, The Institute of Ecology, Indianapolis, Indiana. Marten, G. G. 1980. Simulation Games, Overlays, Computer Graphics and Other Visual Means for Demonstrating the Environmental Consequences of Land Use. East-West Environment and Policy Institute, Honolulu, Hawaii. _____ and Sancholuz, L. 1982. Ecological Land Use Planning and Carrying Capacity Evaluation in the Jalapa Region (Veracruz, Mexico). Agroecosystem (Forthcoming). Martono, A. 1979. Energy and Environment in Indonesia. Paper presented to East-West Environment and Policy Institute Workshop on Environmental Dimensions of Energy Policies, 26 March-6 April 1980. Mimeo, Research Materials Collection (Energy/Indonesia), East-West Environment and Policy Institute, Honolulu, Hawaii. Marzola, D. L. and Bartholomew, D. P. 1979. Photosynthetic Pathway·and Biomass Energy Production. Science 205: 555-559. MITRE Corporation. 1977. Silvicultural Biomass Farms, 5 vols. : I. Summary, II. The Biomass Potential of Short Rotation Farms, III. Land Suitability and Availability, IV. Site Specific Production Studies and Cost Analysis, V. Conversion Process and Cost. MITRE Tech. Report 7347 (reproduced by NTIS). Morris, G. 1980. Integrated Assessment Issues Raised by the Environmental Effects of Biomass Energy Systems: A Case Study. Energy Resources Group Report ERG-WP-80-6, University of California, Berkeley. Mulcock, C. 1981. A Teaching Exercise for Environmental Assessment. Working Paper, East-West Environment and Policy Institute, Honolulu, Hawaii. Myers, N. 1980. Bioenergy for Kenya: Some Technical Possibilities. Energy and Environment in East Africa (March), p. 253. Nielson, P. E. et al. 1977. Plant Crops as Sources of Fuel and Hydrocarbon-Like Materials. Science 198:942-944. Perera, W. R. H. 1979. Biofuel Systems and Plantations--Energy Farms: Their Environmental Implications. Working Paper, East-West Environment and Policy Institute, Honolulu, Hawaii. Pryor, L. D. 1975. The Biology of Eucalyptus. Study in Biology No. 61. Revelle, R. 1980. Energy Dilemmas in Asia: The Need for Research and Development. Science 209 (July): 164-174. Siddiqi, T. A., Carpenter, R. A., and Hufschmidt, M., eds. 1981. Report of 9-21 March 1980 Workshop on Environmental Standards and Energy Policies. East-West Environment and Policy Institute, Honolulu, Hawaii. Westman, W. E. 1977. How Much Are Nature’s Services Worth? Science 197:960-964. Widagda, L. Christanty. 1981. Biophysical and Environmental Constraints of the Plantations in Hawaii. Working Paper, East-West Environment and Policy Institute, Honolulu, Hawaii. Willington, I. P. and Marten, G. G. 1982. Options for Handling Stillage Waste from Sugar-Based Fuel Ethanol Production. Resource Conservation (forthcoming). Wojik, D. 1975. Issue Analysis: An Introduction to the Use of Issue Trees and the Nature of Complex Reasoning. Mimeo, Carnegie-Mellon University, Pittsburgh. Yang, V. and Trinidade, S. C. 1979. The Brazilian Gasohol Program. Development Digest 17: 12-34. 1980. Dept. of Home Affairs and Environment. The Environmental Implications of Alcohol Fuel Production from Biomass and Their Bearing on Energy Research and Development Programs. Environmental Studies Paper I/EI-7, by I. Gorie, Canberra. 1976. Dept. of Land and Natural Resources. Forest Potentials for Hawaii. Honolulu. 1979. Dept. of Planning and Economic Development. EIS Handbook for Hawaii. By R. J. Scudder. Honolulu. 1980. ___. Ethanol/Gasohol for Hawaii. Honolulu. 1980. ___. State Energy Plan: A State Functional Plan Prepared in Accordance with Chapter 226, Hawaii Revised Statutes. Honolulu. 1981. ___, and Lawrence Laboratory (Berkeley, California). Hawaii Integrated Energy Assessment (6 vols. : I. Executive Summary, II. Alternate Energy Technologies for Hawaii, III. Projecting Hawaii’s Energy Future: Methodology and Results, IV. Energy Data Handbook, V. Rules, Regulations, Permits and Policies Affecting the Development of Alternative Energy Sources in Hawaii, VI. Perceptions, Barriers, and Strategies Pertaining to the Development of Alternate Energy Sources in the State of Hawaii). Honolulu. 1980. Ofc. of Environmental Quality Control. Field Tests on Ambient Air-Dried Pineapple Plants for Use as a Solid Waste Fuel for Biothermal Electrical Generation. Report by J. Crouch. Honolulu. 1980. State Environmental Council. Hawaii’s Environment 1979. Honolulu. 1979. State Senate, Committee on Economic Development and Energy. Legislative Energy Handbook (2 vols.). Ed. T. C. Yim. Honolulu. 1980. University of Hawaii. An Environmental Overview Program for Land-Based Alternate Energy Development. By S. M. Siegel and B. Z. Siegel. Pacific Biomedical Research Center, Honolulu. 1965. ___. Detailed Land Classification, Island of Hawaii. For Land Study Bureau by H. L. Baker et al. Honolulu. 1977. ___, and Stanford University. Biomass Energy for Hawaii (4 vols. : I. Summary and Background, II. Sugar Operations, III. Mixed Municipal Refuse, IV. Terrestrial and Marine Plantations). Biomass Energy Study Team, Institute for Energy Studies, Stanford University, Stanford, Calif., and Hawaii Natural Energy Institute, Honolulu. Honolulu, City and County of. 1979. Dept. of Public Works. Environmental Impact Statement Preparation Notice for the Proposed Program of Waste Energy Recovery (HPOWER). Honolulu. 1979. Ofc. of Energy Coordinator. Summary of an Action Program for Molokai Electrical Energy Self-Sufficiency by 1983. Hawaii Natural Energy Institute, University of Hawaii, Honolulu. 1979. Energy Research and Development Committee. The Potential of Energy Farming for Transport Fuels in New Zealand. Auckland. 1980. Ministry of Energy. Ten Year Energy Program, 1980-1989. Manila. 1975. Dept. of Agriculture. Control of Water Pollution from Cropland. Report No. ARS-H-5-1, by B. A. Stewart et al. Washington, D.C.
1976. ___. Erodibility of Selected Hawaii Soils by Rainfall Simulation. Agricultural Research Service Doc. No. ARS-W-35 (May), by E. W. Dangler et al. Washington, D.C.
1960. ___. Leucaena Leucocephala: Description, Culture, Utilization. Handbook No. 450, by A. J. Oakes. Washington, D.C.
1978. ___. Predicting Rainfall Erosion Losses: A Guide to Conservation Planning. Agri. Handbook No. 537, by W. H. Wischmeier and D. D. Smith. Washington, D.C.
1979. Dept. of Energy. Environmental Data for Energy Technology Policy Analysis. Report No. HCP/EV-6119, MITRE Corporation, Springfield, Va. (reproduced by NTIS). 1979. ___. Environmental Development Plan: Biomass Energy Systems. Report No. DOE/EDP-0032, Washington, D.C.
1978. ___. The Eucalyptus Energy Farm: Feasibility Study and Demonstration, Phase I: Site and Species Selection (for Marelco, Inc.). Report by E. O. Mariani et al. 1978. ___. Fuels from Biomass Programs. DOC /ET-0022, Washington, D.C.
1977. Energy Research and Development Administration. Solar Program Assessment: Environmental Factors, Fuels from Biomass. Report No. ERDA-77-4717, Washington, D.C.
1977. Environmental Protection Agency. Compilation of Air Pollution Emission Factors. EPA Report No. AP-42; Washington, D.C.
1979. ___. Land Use and the Environment: An Anthology of Readings. For Ofc. of Research and Monitoring, Environmental Studies Division, Washington, D.C.
1978. ___. Preliminary Environmental Assessment of Biomass Conversion to Synthetic Fuels. Report No. EPA-600/7-78-204, by Batelle Laboratories (Columbus, Ohio). Washington, D.C.
1980. Fish and Wildlife Service. PAN: A Refuge Resource Planning General Information System. By Systems Application Group, Western Energy and Land Use Team, Fort Collins, Colorado. 1971. Soil Conservation Service. Engineering Field Manual. Washington, D.C.
1978. UNESCO/UNDP/FAO.·Tropical Forest Ecosystems. Rome. 1976. A Framework for Land Evaluation. Soils Bulletin No. 32. Andre Ghirardi (Lawrence Berkeley Laboratory), Gregory Morris (Energy and Resources Group, University of California, Berkeley), and Helen Braunstein (Oak Ridge National Laboratory) made invaluable contributions as consultants with the group.